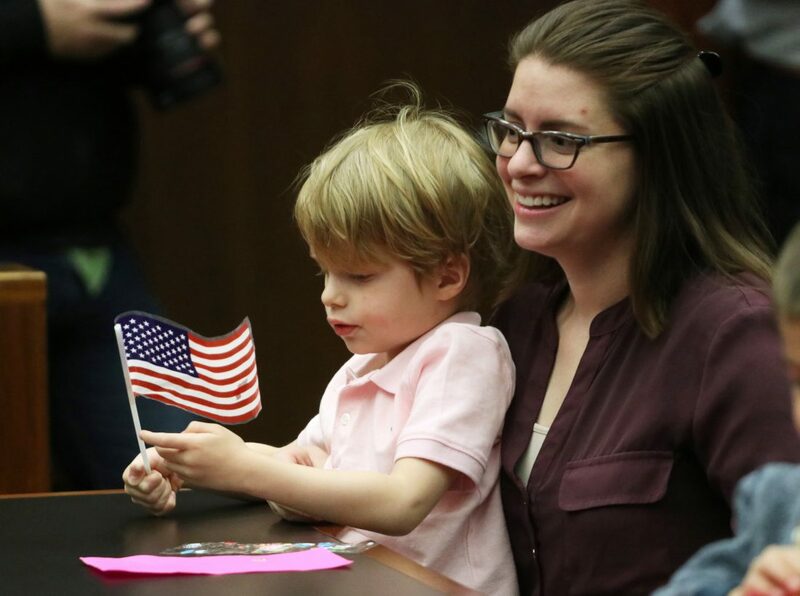 KAREN VIBERT-KENNEDY/Sun-Gazette Marissa Rojas and her nephew, Jude, 3, listen to Marissa’s father, Juan Rojas, speak during the Naturalization Ceremony Friday at the U.S. Middle District Court in Williamsport. Thirty-nine immigrants from 23 countries came to Williamsport’s federal building Friday, to be naturalized as United States citizens. U.S. Middle District Judge Matthew Brann presided over the ceremony — the district’s first of the year. “Each of you, today, have a remarkable story of how you come to be here this morning,” he said. Juan Rojas, now a resident of Muncy came from Bolivia in 1977, was among those naturalized. “We’re becoming citizens of this great country formed by so many different nationalities and great people,” he said to his fellow immigrants. Smiling her way through the ceremony was Dajnika Main, of Shinglehouse, previously from Latvia before coming to the United States in 2011. Main said she looks forward to getting a job that requires citizenship and eventually become a certified public accountant. She is an active part of the community and works with missionaries at her local church. After pledging an oath of allegiance and the pledge of allegiance, those naturalized were granted their name changes and were handed their certificates, followed by U.S. Flags by the Lycoming Chapter, Daughters of the American Revolution.